This also one of Hardaway's biggest improvements, kid is night and day from last year from rebounding, shooting and ball control. Hopefully he will be able to maintain his recent play. He's been really impressive. Burke, on the other hand, has not been. He's not necessarily hurting the team, he's just not been the force I was expecting. While Burke's numbers are good there does seem to be something off with him in the first few games. I don't know if he is trying to do too much as last year he was "the" player for UM and this year he doesn't have to do as much with the additional scorers. Perhaps he isn't in sync with or doesn't trust the freshmen yet? Not sure what it is but I agree that something is different with him. I'll be at the game tonight. Look for me on tv. UM looking crazy good early against what is supposed to be a very good NC State team. Another quality win for Michigan. Final was 79-72. Got a little close at the end when Michigan tried running the clock and couldn't get any good shots off. Good games by Burke and Strauskas. Strauskas is the real deal, and he has to be starting over Vogrich in the near future. Probably about a 50-50 chance Michigan will be 16-0 heading into Columbus on January 13th. If OSU takes care of Duke tomorrow, they could be #1 and #2 when they face off. Michigan again looked really good last night. Couple of things that confuse me though. After Stauskas scored 13 points in the first half Beilien brought in Akunne, who immediately took two horrible shots and got carved up on defense. I get that Akunne is a senior and all, but he would have a hard time playing on any MAC team, he is tremendously awful and annoyingly slow. Why does Beilien give him any playing time? Beilien seems to think that Vogrich, Akunne and Horford need to be seeing minutes as well. It's fine when we are playing the IUPUI's of the world, but a team like NC State? Give me a break. I think Beilein is playing with the roster and getting some time for players "just in case" something happens down the road. Did it last year as well, UVA game was frustrating in this regard. When B1G season starts the rotation gets lock down and you see little of this experimenting etc etc. Horford is a very serviceable big. I have no problem with him playing. Vogrich is OK as the 9th guy off the bench. He seems to understand his role, rebounds a little and plays OK D. What's disturbing about Akunne is that not only is he not serviceable, but he doesn't understand his role. He should never shoot the ball unless he's wide, wide open, yet he's throwing up contested 3s and long twos. I have a feeling his performance last night is going to find Eso a permanent spot on the bench (mop-up duty excluded). A wild card is Caris LeVert. He could potentially take over Vogrich's role as the primary backup 2/3. He could be a real asset with his length and athleticism on defense. Unless they red-shirt him, which is the way it is looking. I think Vogrich will see his 5-10 minutes of action all season long. Probably worth it to redshirt him given our depth. I agree. At this point Beilein has his rotation down. We have already seen some good teams and once the Big Ten schedule starts there won't be time for tinkering. I don't have an issue with LeVert redshirting. Pretty sure akunne only got time in the first half because vogrich eliminated himself from the rotation with his two quick fouls. 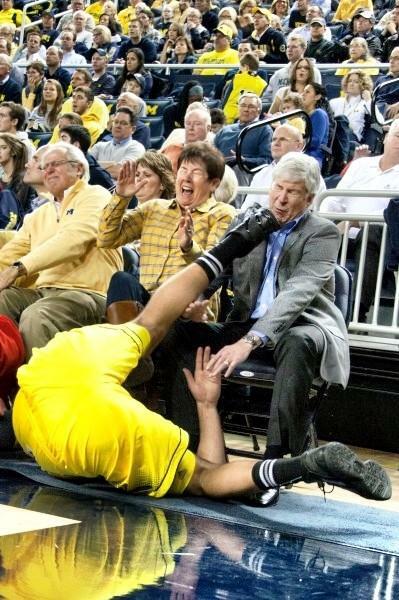 Beilein obviously felt the need to get other guys a breather at that time. Back to back possessions where eso took a shot was too much and he was promptly called back to bench. Akunne has played in very game thus far. It has to stop. During the non-conference season he always plays with lineups for some reason, and I agree, Eso shouldn't see the floor. Or Vogrich for that matter. But I think the only reason Vogrich starts is so he can bring Stauskas' instant offense off of the bench, rather than him taking shots away from Hardaway or Burke. I am sure the rotation will be set by the conference season. Looks like Beilein agrees with me. Horford didn't play, Akunne didn't play and vogrich is no longer starting/playing. Michigan played well in a hostile environment and got a road win today. LeVert saw his first action. I would say no redshirt. Vogrich and Akunne just couldn't get it done. Man did Burke look good last night. That was a pretty convincing win over Western. Burke had 20-7-3-3 to go along with zero turnovers. Michigan likes to throw the lob to GR III, they haven't quite got the timing down yet, but once they do it will be awesome. The game against WVU in Brooklyn, is that for any reason or is it just a random neutral site game? I think he was answering my question about the rationale of the game. I think you are misunderstanding what I was saying. You said it had to stop, "it" being giving a couple minutes to akunne here and there. My point was that they could still give a few minutes to akunne and win basketball games. LeVert having his redshirt burned adds one more player to the rotation, making it less necessary to look to end of the bench when the starters need a break, but that wasn't the case before. Using akunne or someone similar is not an indefensible move. The team has so many scoring options that they can get away with using a lower skill player for a few minutes here and there, without it adversely affecting the result. With him on the floor, it allows other players to get some much needed rest. If you simply eliminate a player from the rotation altogether, that could adversely affect the performance of other players if they don't get the rest they need. On balance, I don't think it makes much of a difference if he played or didn't play, but it didn't "have to stop." That being said, I'm happy to see that LeVert has shown enough to justify playing him at te expense of some of the bench players, because it must mean that they think he is better and not just equivalent. Improving the talent in the rotation is a good thing. As for vogrich starting or not starting, I don't think it matters. I'm more concerned with the minutes that everyone plays, and he wasn't seeing a lot of playing time, despite starting. Horford is very clearly a sub an his playing time will fluctuate game to game depending on the situation. Missed that in skim reading the thread, apologies to both.